The Corbett administration announced yesterday that state records of Penn State trustees should be subject to Pennsylvania’s open records law. Conceding a key issue in a dispute over whether trustee records of Secretary of Education Ron Tomalis are public, an administration spokesman told the Pittsburgh Tribune-Review that a ruling by the Office of Open Records improperly exempted those documents from public disclosure. That ruling is the subject of a lawsuit by Penn State alumnus Ryan Bagwell, who sought records from the Department of Education about Tomalis’ trustee activities. Though the department released some records, the OOR ruled that any records received in Tomalis’ capacity as Penn State trustee weren’t subject to the requirements of the Right-to-Know Law. In a March 28 court filing, Corbett lawyers said they disagreed with the OOR’s opinion, arguing standard RTKL exemptions should apply instead. They also argued that the state has an obligation to protect private institutions, like Penn State, from having their records disclosed. But an administration spokesman yesterday said even though Penn State isn’t a government agency, records that make their way into the hands of state officials should be subject to the RTKL. 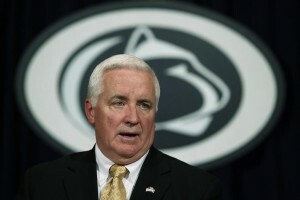 “The department has requested that the Commonwealth Court decide this appeal in its favor based on statutory exemptions under the law, and not on any prior decision that has held that PSU was not subject to the law,” spokesman Nils Hagen-Frederiksen told the Tribune-Review. The Commonwealth Court will decide whether the Department of Education properly withheld the remaining records later this year. Oral arguments in the case are scheduled for June. The decision is a victory for open-records advocates, who argue that Pennsylvania’s four state-related universities should be more transparent. Even though they’re mostly exempt from the RTKL, records of the state officials who sit on their governing bodies are public. By law, state-related universities are required to appoint the governor and secretary of education to their boards.